A 1955 Arnold Scaasi dress, flanked by a 1992 Bob Mackie (left), and a 1998 gown by John Roberts (right). Perhaps you’d like to slip into this lovely 1955 flower-print dress by Arnold Scaasi for your Easter celebration? 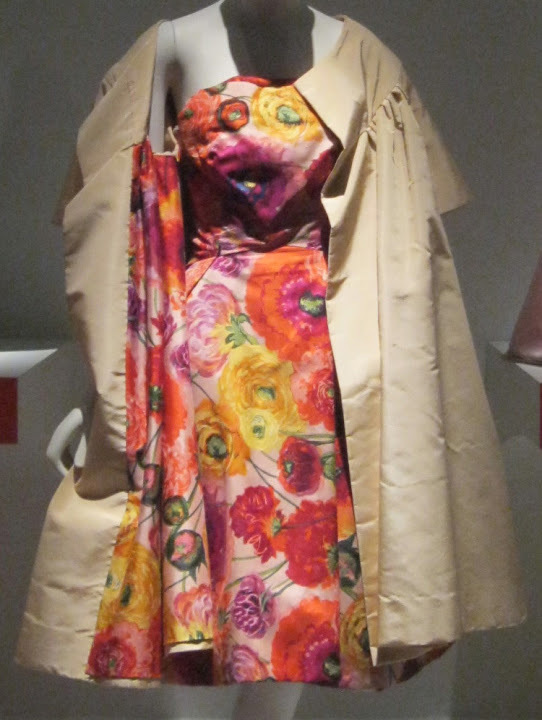 It’s now on view at The Museum at FIT as part of the exhibit IMPACT: 50 Years of the CFDA. Scaasi was born Arnold Isaacs in Montreal, Quebec, Canada in May 1930. He apprenticed with the House of Paquin in Paris before moving to New York City where he worked for famed American couturier Charles James. As a young designer it was suggested to him at a fashion shoot that he reverse the letters in his last name to Scaasi, to give it an Italian flair. Not long after making the switch, his work was featured on the December 1955 cover of Vogue. He has created gowns for First Ladies Mamie Eisenhower, Barbara Bush, Hillary Clinton, and Laura Bush. In 1969 Barbra Streisand was wearing his shimmering and sheer overblouse and pants ensemble when she won her Oscar for Best Actress for Funny Girl (she tied that night with Katharine Hepburn for The Lion in Winter). The attention that outfit garnered made him an overnight sensation. Scaasi is also one of the 20 original founders of the CFDA. I love the print and colors of this dress and the coat’s matching lining. Styled the right way I’m convinced this dress could be worn today. Maybe a thin necklace of yellow diamonds, some strappy silver sandals, and a tiny glittery minaudière. What do you think? What a wonderful present Jill.